Television, newspaper and online stories about me? I was really surprised that there was so much interest in just a little ole koala. I have to admit it was a bit frightening at first to see all those television cameras but the folks here at the Palm Beach Zoo made me feel very comfortable and the media seemed to really enjoy meeting me. 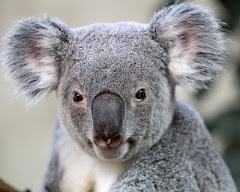 I love to eat eucalyptus leaves and sleep late. I'm eager to find my soulmate because our Koala population has dwindled dangerously. I'm looking for a home where we can raise our own little joeys in safety. Great Party - thanks everyone!